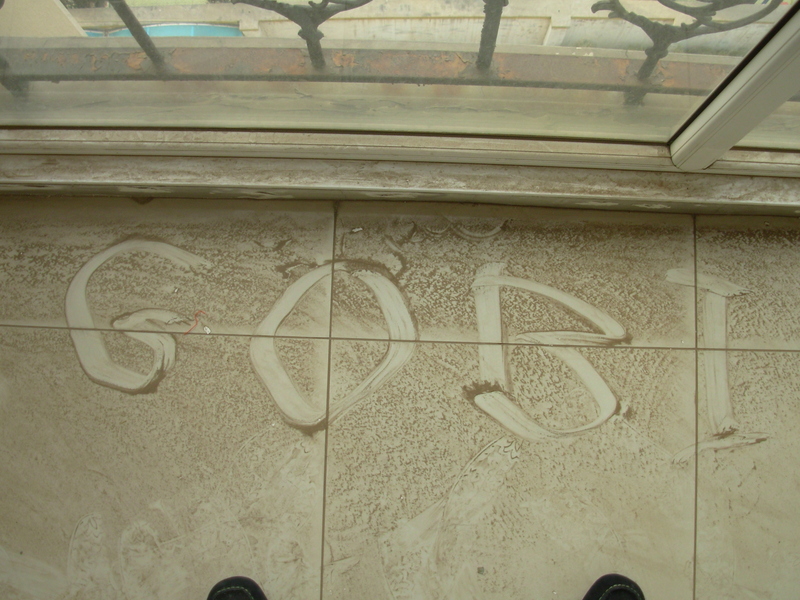 The result of one dust storm on the floor of a patio at my Beijing apartment. 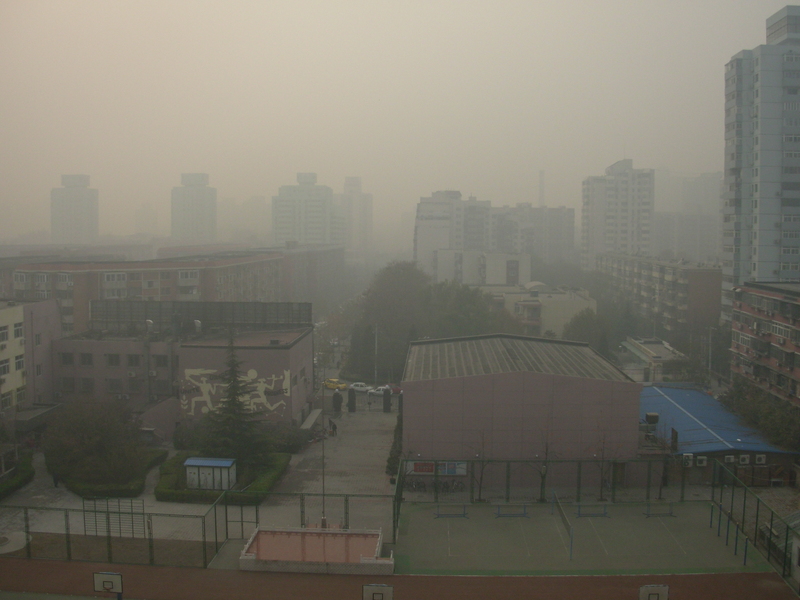 Smog obscures the view of anything more than one block away from my Beijing balcony. A month after arriving in Beijing, I gave up wearing contact lenses. The grit in the air made it too painful. Some of it was sand blowing in from the encroaching Gobi desert. But much of it was pollution in the form of particulate matter big enough to scratch eyes and clog lungs. In winter, the air in Beijing is especially dangerous. Cold-weather demand for heat greatly increases the amount of dirt spewing from China’s coal-burning power plants. Combine this with fumes from an astounding level of car traffic running on low-grade gasoline, and the result is sickening. By January, the expats at China Daily had turned into mucus factories on overdrive. For days, we were forced to breathe through our mouths, carry big boxes of tissues everywhere and try to sleep sitting up, since any attempt to recline brought on coughing fits. We could feel the stuff bubbling in our lungs. Those who smoked fared even worse. Some developed chronic bronchitis. All of us needed to take a few sick days. To get them, we had to go to a China Daily-approved doctor and get a certificate attesting to our illness. Imagine the fun of this, feeling sick as a dog but having to haul yourself up, stumble out into the cold and hail a cab to drive you the whole two blocks to the China-Japan Friendship Hospital, our designated healthcare provider. Like everything else in Beijing, their blocks are huge. Walking two of them while sick was to be avoided. There was almost another block to walk at the hospital, where the wing devoted to treating foreigners is at the far end of the place. Supposedly, the staff speaks English. In reality, they know a few words. They can ask whether you speak Chinese or Japanese. Mostly, they gesture and point when communicating where you should go next. Your first stop is at an intake desk. The workers there wear face masks. As soon as you tell them you have a runny nose and cough, they hand you a mask and insist you wear it. It’s amazing how much of an impediment that small piece of cloth can be. Your face gets very hot because your breath is trapped under it. Just enough escapes out the top to fog your glasses. It’s hard to make yourself heard, especially if a scratchy throat and cough already have played havoc with your voice. It’s cold in the hospital. The nurses and doctors wear sweaters and jackets while they work. Garbage has blown in through an open door. It just sits there. Sunken old couches and chairs line the hallway outside the doctors’ offices. This is where you wait, breathing into that damn mask. The doctor, a nice woman, sticks a tongue depressor in your mouth and tells you to say “ahhh.” Then she pulls out a stethoscope and listens to your lungs – right through your clothes, even if those include a thick sweater and bra. She wants blood drawn, gives you a piece of paper and points towards the nurse’s station. The nurse points to the cashier. You will go to the cashier every time a doctor wants a test done or a medicine prescribed. Nothing is provided until you’ve paid for it in cash, upfront. When you have a receipt for payment, you go back to the nurse’s station to proceed with the test. Then, prescription in hand, you once again go to the cashier. Receipt in hand, you can go to the pharmacist. She speaks no English at all. Our Chinese colleagues routinely warned us to insist on prescriptions for Western medicine, not “TCM” – traditional Chinese medicine. For colds, this would include herbal teas, miso soup or concoctions containing cinnamon twig, ginger root, kudzu root and licorice. Glass cases displayed bones, antlers, claws and horns, many of them from endangered species. Western medicines are very hard to find and very expensive when you do find them. It’s cheaper and safer to have them bought in America and shipped over. Chances are much better you’ll get the real McCoy, instead of an ineffective knockoff. For some reason, the Chinese are particularly wary of antihistamines. They also regard blowing one’s nose into a tissue as a disgusting Western practice, while Westerners are appalled by the Chinese habit of emptying one’s nostrils right on the street, snorting clear first one, then the other. One of our Australian colleagues had the bad luck to be hospitalized with appendicitis. It had to be removed. During his stay, he was required to pay cash every day before midnight. He would throw a coat over his pajamas and, holding his fresh stitches together, tramp all the way out to the street where he could withdraw yuan from a bank ATM, then hobble back to his hospital bed. Even though we had insurance from our employer, the best healthcare solution was the same as for those back home with no insurance – don’t get sick. This entry was posted in Commie wage slave, Uncategorized and tagged air pollution, antihistamines, Beijing, China, China Daily, China-Japan Friendship Hospital, face masks, health insurance, healthcare, traditional Chinese medicine. Bookmark the permalink. Wow – That was fun! (Not). Especially the poor fellow with appendicitis who had to pay before midnight every night – after going out in the cold to ATM it. Thanks again for such a clearer and clearer picture of how really LUCKY we are to be born and brought up in this country. Ignorance here surely is bliss!